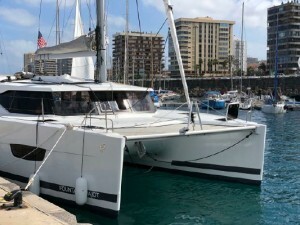 2019 model year, 2018 built Fountaine Pajot Lucia 40 found in excellent condition ready for this season. This is a great opportunity to get a like new Fountaine Pajot Lucia 40 without the two year wait from the factory. Whether you are looking for family cruising or to set up charter boat this FP Lucia 40 is ready to be adapted for your needs. This catamaran comes with a good set of safety equipment including a 8 person liferaft, flares, AIS, and lifejackets. © Copyright Nicolle Associates 2009-2019 - Privacy Statement - Site by Boats Group.